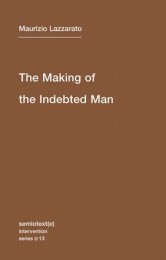 At the outset of The Making of the Indebted Man, in its foreword, Maurizio Lazzarato points out the necessity to “construct the theoretical weapons for the struggles to come” (2012: 11). This is perhaps the most important aspect of Lazzarato’s incisive “venture into enemy territory” (ibid.) – the territory, not simply of finance, but of the debt, or extortion, economy. Indeed, as Lazzarato explains, what is usually called finance economy is really a debt economy: interest for the capitalists and banksters, debt for the rest of us. It is a venture into the territory, not simply of crisis, but of catastrophe; the territory of “infinite debt” (77), of the logic of security, the politics of subjection, and the quicksand of guilt. He builds these much-needed “theoretical weapons” by using important elements from the philosophies of Marx and Nietzsche, from Deleuze and Guattari’s Anti-Oedipus, and their notions of the univocity of production and antiproduction, from Foucault’s thinking on biopolitics, and from other (perhaps unexpected) motifs of reflection, such as the “short philosophical digression” on William James (65-71), which, Lazzarato says, “the reader may possibly wish to skip” (66), but which this reader highly recommends. The book begins with a qualified notion of the class struggle. It is the class struggle itself which is “today unfolding and intensifying … around the issue of debt” (7). Both in the foreword and toward the end of the book, Lazzarato makes very clear what this essentially and concretely means: “Debt surpasses the division between employment and unemployment, working and non-working, productive and assisted, precarious and non-precarious…” (162; cf. 7). Capital, the Universal Creditor, is everywhere. Indeed, “debt cuts across every domain” (161). Today, we hear that in Europe alone twenty million people are unemployed. It makes sense to think of the necessity, as Lazzarato says, “to shift our perspective from labor and employment” (162). The coming struggles, entailing a reinvention of ‘democracy’ (Lazzarato’s scare quotes), go well beyond that. They reach into the substance of all existence, as debt –the ugly face of contemporary Capital—becomes existential debt, that is to say, a real existential threat and a path to death, as we know all too concretely from the many tragic cases of people taking their lives due to debt. What must be examined, Lazzarato says, is the so-called ‘new economy,’ which deprives people of political power and, of course, of wealth: it deprives them of “the future, that is, of time, time as decision-making, choice and possibility” (8). It is the issue of possibility (and thus, time) that comes back in the section on James. The result of this is the subjective figure of the indebted man, of which Lazzarato offers a genealogy. This requires that one go beyond the idea of the economy narrowly construed and look at debt as a power relation, a “universal power relation, since everyone is included in it” (32). It is in this sense that the concept of finance economy does not work and that a “non-economistic reading of the economy” (72) becomes necessary. Indeed, debt becomes something like original sin in that it is acquired through inheritance. One is born in debt, and through the process of constant evaluation (see 137-145), the subjectivity of the indebted man (homo debitor) is constructed and projected to infinity. But what is the figure of the indebted man in relation to labor – and this, regardless of whether one works or not? What is the labor that the indebted man or woman must constantly undertake so that the ‘morality’ of debt may work and the spurious infinity of guilt bear its sad fruit? We know that for Lazzarato, who goes back to Nietzsche here, the morality of debt entails the construction of memory, guilt, fear and bad conscience in the economic subject, the entrepreneur of the self. (130). So, precisely, the answers to the above questions will be found in one of the most interesting notions Lazzarato discusses: the notion of the entrepreneur of the self. The examination of the figure of the entrepreneur (and, in particular, the entrepreneur of the self) allows Lazzarato to engage in a poignant critique of neoliberalism and, to an extent, Foucault’s understanding of it. Far from embracing the notion that everyone has to become an entrepreneur – as if this could be a path to liberation – Lazzarato shows that indeed this is what the neoliberal economy (in this sense, a subjective economy, for it produces subjectivity) demands from all of us. The figure of the entrepreneur (of the self) is the figure of the indebted man, and thus the opposite of the subject of liberation. What characterizes that figure is infinite debt: infinite work, infinite effort and striving for the mere aim of escaping bare life, whose only horizon is death – a life of debt that ends only in and with death. The politics of subjection, typical of the neoliberal economy, has a biopolitical and thanatopolitical meaning, namely, the right of life and death that power (of the sovereign, disciplinary, or pastoral kind) has over everybody. The moral and legal injunction to labor is also an injunction to work on the self (42). Lazzarato says: “Economic production and the production of subjectivity, labor and ethics, are indissociable” (49). He points out that this is precisely what Nietzsche calls the ‘labor of man on himself’ and a ‘self-torture’ (42). He goes into a reading of Nietzsche’s sections on the construction of memory in Genealogy of Morals. The aim of this construction is the control of the future (45). The question of the future, in particular of the control of the future and the annihilation of the possible – a question which comes back in the section on James – is very important here. It is also linked to the question of security: the logic of security, which is today’s main ideological justification for the system’s use and abuse of power against everybody. I say today, but I should perhaps say ever since Hobbes. I will go back to this when I address Lazzarato’s reading of Foucault’s modes of power. What is important for now is the idea that debt also functions as a “security-state technique of government” (46), and that it is not simply an economic mechanism. Lazzarato continues with a very interesting reading of Marx’s essay on James Mill and then of his theory of credit in the third volume of Capital. It is here that the logic of security, based on universal distrust (57), gives rise to the most thorough and powerful application of the mode of debt: existential debt. What is evaluated now is not only “the skills and know how of the worker,” but also “the poor man’s actions in society …, that is, his lifestyle, his social behavior, his values, his very existence” (59). What we— especially in American cities—experience as racial profiling (the odious ‘stop and frisk’ law in New York City for instance), is the direct result of the logic of security and debt, of the constant evaluation of vast sections of the population and the curtailment of time (and space) – the curtailment of the healthy indeterminacy of the possible. Lazzarato first speaks of a “very Nietzschean Marx,” and later, when he goes into the theory of credit, of Marx and “objective” debt. For lack of space, I will not go into that, except to say that we find here the important assertion that “there is only one capital and one valorization process.” There is, Lazzarato notes, no distinction between a “real economy” and a “financial economy,” and this is already true in Marx: “The formula for financial capital, that is, self-valorizing money (M-M’), fully captures the logic of capital” (62). The world must contain indetermination, an open temporality in the process of realizing itself, that is, a ‘present’ which encompasses possible alternatives and, thus, possibilities of choice and existential risks. It is these possibilities and the unpredictable alternatives that debt seeks to neutralize (70). This means that the “logic of debt is stifling our possibilities for action” (71). Money as capital destroys time, and it destroys life. Everyday life, for each person, for each singularity and subject, is reduced to constant work on the self, which distorts and destroys the self’s genuine possibilities as well as its alternatives by reducing everything to the formula of a flat uniformity, to docility, and the univocity of production. Precarity is the existence and essence of the entrepreneur of the self, who no longer possesses rights, but is rather compelled to constantly act and work in accordance with the ideology of risk and the notion that the self itself is his/her capital (‘human capital’). The conclusion is contained in the premise: a self that cannot be but enslaved to debt. This is indeed both the conclusion and premise of the murderous logic of debt. What becomes a commodity, invested by the power relations of money as debt, is no longer simply a person’s labor-power, the time of labor, but all power and all time. It is life itself, which is now indistinguishable from death. Indeed, I believe that this is one of the most important arguments made by Lazzarato’s book: the life of the indebted person is the same as death. This becomes particularly evident when debt becomes social, a category Lazzarato takes from Foucault. Social debt happens when the prison extends to society as a whole, when the chains of slavery are everywhere, and society no longer has any autonomy vis-à-vis the State, but it is the product of governmental techniques (125), as well as the field of action of the police. This is when debt, the prison of debt, is extended to the social as a whole. The injunction to constantly work and to work on the self, to “become one’s own boss,” shifts to society the costs and risks of business and the State (93). It is in this context that Lazzarato deals with Foucault’s three modes of power: sovereign, disciplinary, and biopolitical power. With biopolitical power, and in particular, pastoral power (see 128), the neoliberal shift to the subjective economy of risk and debt is fully accomplished. However, the question remains as to whether all these forms of power are not instances and mutations of the same original sovereign power. This is a question that probably must be posed more in relation to Foucault’s texts, especially The Birth of Biopolitics, than Lazzarato’s book. Indeed, it seems to me that Lazzarato retains the centrality of sovereign power by precisely showing the limits of Foucault’s exceedingly positive view of the passage from one mode of power to the other and of his ambivalent/ambiguous reading of liberalism. In this context, Lazzarato speaks of Foucault’s “political naiveté” (108). To conclude my brief remarks on this important book, I want to note that Lazzarato does not only give us a genealogy of the indebted man and the theoretical weapons for the struggles to come – something which is in itself of exceptional value, but he also concretely outlines what must be done as well as the aims of these struggles. It is the cancellation of all debt which can bring about the conditions for a better world. For Lazzarato, the cancellation of debt and the deactivation of its genocidal machine means the abolition of the system of Capital. The aim is a second innocence: the possibilities to start afresh, the possibility of moving within the indeterminacy of ever-new possibilities. Bruno Gullì teaches in the Department of History, Philosophy and Political Science at CUNY-Kingsborough. He has published two books on the questions of labor and sovereignty: Labor of Fire: the Ontology of Labor between Economy and Culture (Temple University Press, 2005) and Earthly Plenitudes: a Study on Sovereignty and Labor (Temple University Press, 2010). He is now working on a third book-length study of the same questions with a focus on the centrality of the notions of disobedience and care.